SEPTA makes good on one if its promises. Some background: In 1992, the board of the Southeastern Pennsylvania Transportation Authority voted to end streetcar service on three trolley lines: Route 23 Germantown Avenue 11th and 12th Streets, Route 56 Erie and Torresdale Avenues, and Route 15 Girard Avenue and Richmond Street. Previously, during the 1980s, the SEPTA board had voted to remove streetcars from city transit Routes 60, 50, 53, and 6, permanently replacing those trolleys with diesel buses. Promises were made in 1992, that the use of diesel buses on Routes 23, 56, and 15 was temporary, with 1997 given as the year a new fleet of streetcars were to be in service. Nineteen-ninety seven rolled around, and it became increasingly apparent to observers that SEPTA had no intention of bringing back the trolleys. The rails and wires on the three routes remained in place, but noisy polluting diesel buses provided the service. In September of 1997, a City Council hearing was convened, to give SEPTA, the City, and advocacy groups a forum to voice their positions. For details on that hearing, click here. It was at that hearing, that then-SEPTA General Manager Jack Leary announced SEPTA's intention to restore trolley service to one of the lines: Route 15, Girard Avenue-Richmond Street. Girard Avenue was to be upgraded to "light rail" standards. SEPTA planned to buy a small fleet of articulated LRVs for use on the subway-surface car lines, the idea being to free up enough Kawasaki LRVs for Route 15. The problem with the proposal, was lack of funds. The budget to renew Route 15's rail infrastructure was cut by nearly half. And, the cost of the new fleet of articulated cars (only 12 units) came in at about twice what was expected ($3 to 4 million apiece). The first problem was solved by simply replacing that part of Route 15's infrastructure that was in the worst condition. Instead of streetcars traversing the wide portion of Girard Avenue in a reserved light rail-style right-of-way, they would run on an existing alignment, sharing the center lanes with left-turning autos. The second problem was solved by proposing to rehabilitate old cars, rather than by purchasing new ones. More on that, later. The entire Girard Avenue project almost fell through, when the line item for the project was quietly dropped from SEPTA's year 1999 budget. Thankfully this did not go unnoticed by the city's transit advocates, and last-minute appeals to the SEPTA board restored the funding. In 2003, work on the Girard Avenue trolley infrastructure is virtually complete. The oldest rail has been replaced, overhead wires renewed, and miles of underground conduit and new substations completed. Work at Callowhill Depot is also complete. Bays 2, 3 and 4 of Callowhill Depot will serve as the operating depot for the new fleet of Route 15 PCCs and for Route 10 Kawasaki LRVs. In 2001, SEPTA chose a contractor to remanufacture a small fleet of eighteen PCC cars, for use on the restored Girard Avenue. The 1947/48-built PCCs are being rebuilt with electronic chopper control, air conditioning, and a wheelchair lift placed in the front half of the center doors. New control consoles are designed like that of the Kawasaki LRVs. This reconstruction is intended to extend the service life of the PCC another 15 years. No federal funds are to be used in this project, and the specifications include such cost-cutting measures as the utilization of seats from SEPTA's retired Volvo articulated buses. Brookville is fabricating entirely new trucks (wheel assemblies), with new motors and brakes, based on the PCC B3 truck design. The rebuilt PCCs will be renumbered, with the new series starting at 2320. November 15, 2001: The SEPTA board voted to go ahead with the PCC remanufacture project. The contract has been awarded to Pennsylvania-based Brookville Mine Equipment Corporation. Brookville has rebuilt diesel switch engines for SEPTA's regional rail division, and is teaming with companies that have specific experience with rail car manufacture, including Pacifica Marine, Mittenwalder Gerätebau, and Vossloh Kiepe. February 25, 2002: 1947 PCC 2750 left Elmwood Depot on flatbed truck, bound for Brookville and remanufacture as part of the Girard Avenue Light Rail project. Seventeen more cars followed, as well as six more for spare parts. November 23, 2004: the last of 18 remanufactured PCC-II cars was delivered to Philadelphia. June 2004 (through most of 2005): due to the situation on 59th Street, the fleet of PCC-II streetcars sits idle, with diesel buses continuing to serve Route 15. July 2005: Philadelphia print media (notably the Daily News) have recently siezed on this story as an example of city politics at its worst. The mayor has since stated that the trolleys will run, though no firm date has been announced. September of this year seems likely. September 4, 2005: Early this morning the first trolley cars entered service on Route 15 Girard Avenue, after a thirteen year absence. 2011: A quarter mile of new double track and a new trolley loop is constructed on Frankford Avenue at Delaware Avenue, opposite Sugar House Casino. 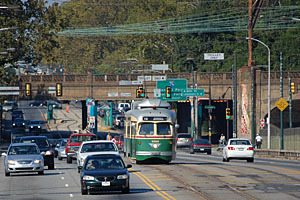 When the eastern portion of Route 15 is blocked by Interstate 95 construction in 2012 - 2016, the new "Northern Liberties Loop" will be the temporary eastern terminus for Route 15 trolleys. Diesel shuttle buses will provide service between Front St & Girard Avenue and Port Richmond during the duration of I-95 construction. November 2011: Trolleys service is suspended for two months, so that rails can be replaced on Girard Avenue in West Philadelphia. Diesel buses to provide all Route 15 service in the interim. January 2012: The suspension of trolley service is extended to April 2012 so that more worn-out rail can be replaced. This $1.2 million investment bodes well for the future of the Route 15 as a trolley line. Click on the rendering to view the Specifications for the PCC-II car. Credit for this rendering goes to Klaus P. Canavan of Vossloh Kiepe, the contractor providing the cars' new electrical equipment.